Home » Reese Witherspoon Is Beautiful In Black In Cannes! 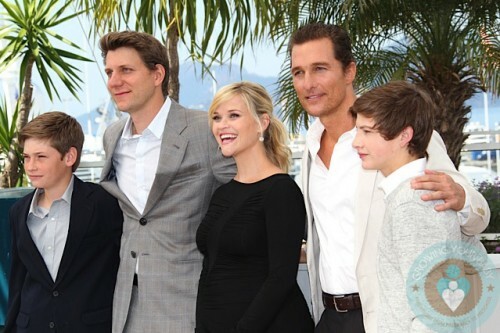 A pregnant Reese Witherspoon was beautiful in black as she stood beside her co-stars Jacob Lofland, Jeff Nichols(director), Matthew McConaughey and Tye Sheridan at a photo call for her new film ‘Mud’ in Cannes, France on Saturday(May 26). Showing off her growing belly in a ruched black dress, Reese gave her look a pop of color with a pair of hot pink pumps. The film’s writer and director Jeff Nichols hailed the actress for her small role in the movie. ‘I needed Reese Witherspoon. Even if her screen time is limited and, bless her heart, I kept her in a motel room most of the time, she still managed to look good. And you have this man (McConaughey) talking about her the whole time. A southern girl, Reese immediately connected with the characters and the film’s location. “I grew up with my brother in a creek on a dirt bike riding around, doing motocross, down in the dirt, fishing in Tennessee, so when I read Jeff’s script it just felt like home. “I never get to see home on the big movie screen and Jeff brought such an authentic, beautiful story to the place and it was just very appealing for me.